The sea trials of the Super Maramu took place in a 30/35-knot wind and a very rough sea. 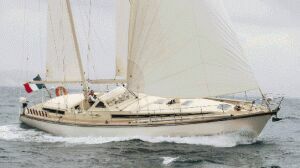 This yacht is a GRP ketch, built by the notorious and widely appreciated French yard Amel. We went to Hyères, on the southern coast of France, where the yard has its own servicing pier and where it moors its queens of the sailing world. This was a special occasion for verifying the seaworthiness and maneuverability of a boat that maintains her promises and that might offer even more. Traditionalist sailors dislike of technological interpretations of sailing boats is more a matter of prejudice than of mental disposition. 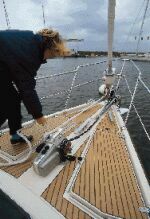 Innovations such as mainsail and jib roller-reefing systems, bow thruster, electrical winches, power assisted blocks, automatic pilots and whatever is technologically new and is applied to a sailing boat worry them. Yet, I suggest them to jump onboard the Super Maramu where they will certainly change their minds and overcome old prejudices that should not apply to these technological solutions. If we had to summarize in a few words our opinion of this 52'6" footer Amel, we could say that we tested a fast close-hauling boat. She is very performing (maximum speed of 11 knots with 30- knot gusts with an angle with the wind of not more than 20-22 degrees) and is very maneuverable. Actually, the Super Maramu (average annual production of 40 units) concentrates technological innovations and patents tested and tuned by the engineering staff of the yard and surveyed by the aged, yet dynamic, Monsieur Amel. Let us not be too lengthy, data and photographs speak better than words. Let me just give an advice: whoever has a little less than a billion liras to spend for a big cabin cruiser should go to Hyères! Price: FF 2,800,000 ex VAT. Swimming ladder: teak and stainless steel swimming ladder to be used on the side of the boat and convertible in gangway. Course steadiness: precise maneuvers are possible with the steering wheel, even on waves. Under power: excellent performing capabilities thanks to the quality of the propelling unit and its leg. The choice of a variable pitch propeller was excellent. The yard paid special attention to the propelling unit and because of this the cruising speed under power is of 7 knots. She could be compared to a motor- sailer with limited noise of engine even at high speed. Docking maneuverability: excellent. The recessed 10-hp bow thruster is controlled by a joystick. Docking in a 30-knot stern wind is possible without using the steering wheel! 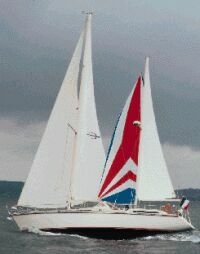 Deck: the roller-reefing mainsail and headsail together with the steering wheel make the central cockpit the main operative position. The cockpit is very comfortable. Deck fittings are of very good quality and all lines are neatly led through the blocks. The standard dodger that may be folded in the cockpit is an interesting solution and it integrates very well in the outside line of the boat. Building materials: high-quality composite materials. 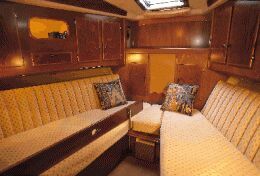 Finishing: very good both on deck as well as belowdeck, mainly due to the 50-year experience of the yard in boatbuilding. Interior layout: the drawings include three separated areas: forward, amidships and aft, two bathrooms near the forward and the aft cabins, an ample dinette with a fully equipped worktop. The chart table is separated and large, opposite the storeroom. Interior decor is elegant because of the large use of wooden doors, bulkheads and linings (African mahogany). 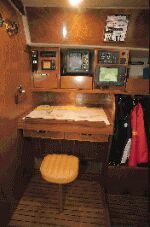 There are several lockers, drawers and open storing spaces that are very useful on cruisers of this type. 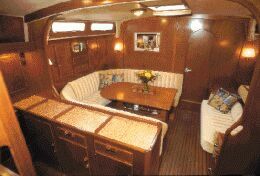 In addition, innovations such as the refrigerator/ice box under the dinette settee, the cable locker-cover stops and the movable footrest in the toilet compartment to be used when sailing close-hauled are very useful and practical. 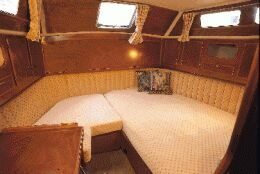 Foredeck arrangement: clean and practical. Chain roller, electrical windlass with support, stainless steel anchor chain and anchor are fitted. The anchor chain is automatically washed. Safety: excellent in the tested boat, especially due to the toe-rail molded in the GRP which serves as a firm foot brace on deck. Shrouds: first-quality and well positioned. 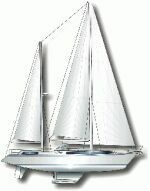 Sails: tri-radial; 2 fully rigged spinnaker poles and two smaller integrated Amel poles. Headsail protection. Headsail lead blocks: 2, suitably positioned. Engine instruments: electrical fuel level gauge and full data instruments. Engine vibration during cruising: absent. Engine vibration during cruising: noticeable, especially when running above average speed. Engine vibration during cruising: minimal. Engine vibration during cruising: slight. Engine vibration during cruising: minimal, perceptible aft. The movable footrests are practical and the wood finishing is very pleasant.